This is plate 7 from Robert Melville Grindlay's 'Scenery, Costumes and Architecture chiefly on the Western Side of India'. Grindlay (1786-1877) was only 17 when he arrived in India in 1803. He served with the Bombay Native Infantry from 1804 to 1820 and during this period made a large collection of sketches and drawings. 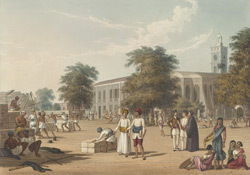 Grindlay explains that in 1811, the Bombay 'Green' was "an irregular area, surrounded by various public buildings and originally intended for the Garrison-Parade; but occupied during the dry season by vast piles of cotton bales, marine stores, and various bulky articles of merchandise."